This website is operated by G Gibson & Co Ltd. Throughout the site, the terms “we”, “us” and “our” refer to G Gibson & Co Ltd. G Gibson & Co Ltd offers this website, including all information, tools and services available from this site to you, the user, conditioned upon your acceptance of all terms, conditions, policies and notices stated here. All content included on the website, such as text, graphics, logos, button icons, images, audio clips, digital downloads, data compilations, and software, is the property of G-Gibson.com, its affiliates or its content suppliers and is protected by international copyright, authors rights and database right laws. The compilation of all content on this website is the exclusive property of G-Gibson.com and its affiliates and is protected by United Kingdom and international copyright and database right laws. All software used on this website is the property of G-Gibson.com, our affiliates or our software suppliers and is protected by international copyright and authors rights laws. You may not systematically extract and/or re-utilise parts of the contents of the website without G-Gibson.com's express written consent. In particular, you may not utilise any data mining, robots, or similar data gathering and extraction tools to extract (whether once or many times) for re-utilisation of any substantial parts of this website, without G-Gibson.com's express written consent. You also may not create and/or publish your own database that features substantial (e.g. our prices and product listings) parts of this website without G-Gibson.com's express written consent. G-Gibson.com and its affiliates respect the intellectual property of others. If you believe that your work has been copied in a way that constitutes copyright infringement, please Contact us. You agree not to reproduce, duplicate, copy, sell, resell or exploit any portion of the website, use of the webiste, or access to the website or any contact on the website through which the service is provided, without express written permission by us. We may, but have no obligation to, monitor, edit or remove content that we determine in our sole discretion are unlawful, offensive, threatening, libellous, defamatory, pornographic, obscene or otherwise objectionable or violates any party’s intellectual property or these Terms of Service. Because G-Gibson.com lists many products for sale on the website and hosts many comments, it is not possible for us to be aware of the contents of each product listed for sale, or each comment or review that is displayed. Accordingly, G-Gibson.com will take all precautions to filter out any Defamatory content and operates on a "notice and takedown" basis. If you believe that any content on, or advertised for sale on, the website contains a defamatory statement, please notify us immediately by Contacting us. Once we have received contact, G-Gibson.com will make all reasonable endeavours to remove the defamatory content complained about within a reasonable time. We do not guarantee, represent or warrant that your use of our website will be uninterrupted, timely, secure or error-free. In no case shall G Gibson & Co Ltd, our directors, officers, employees, affiliates, agents, contractors, interns, suppliers, service providers or licensors be liable for any injury, loss, claim, or any direct, indirect, incidental, punitive, special, or consequential damages of any kind, including, without limitation lost profits, lost revenue, lost savings, loss of data, replacement costs, or any similar damages, whether based in contract, tort (including negligence), strict liability or otherwise, arising from your use of any of the service or any products procured using the service, or for any other claim related in any way to your use of the service or any product, including, but not limited to, any errors or omissions in any content, or any loss or damage of any kind incurred as a result of the use of the service or any content (or product) posted, transmitted, or otherwise made available via the service, even if advised of their possibility. Because some states or jurisdictions do not allow the exclusion or the limitation of liability for consequential or incidental damages, in such states or jurisdictions, our liability shall be limited to the maximum extent permitted by law. You agree to indemnify, defend and hold harmless G Gibson & Co Ltd and our parent, subsidiaries, affiliates, partners, officers, directors, agents, contractors, licensors, service providers, subcontractors, suppliers, interns and employees, harmless from any claim or demand, including reasonable legal fees, made by any third-party due to or arising out of your breach of these Terms of Service or the documents they incorporate by reference, or your violation of any law or the rights of a third-party. Questions about the Terms of Service should be sent to us at enq@g-gibson.com. We will dispatch your order as soon as possible, as we are a manufacturer our lead times can vary. We will send your order by private courier to the delivery address provided. If you do not provide a delivery address, we will dispatch it to the address relevant to the account. Depending on destination, it will arrive with you anytime from the next day, up to 2 weeks (Overseas etc) between the hours of 9.00am and 5.00pm local time. By accepting our terms and conditions, and by further confirming that you understand these delivery time by checking the box labelled "Delivery" on checkout, you accept that there will be someone present to accept delivery of the packages between these hours. If we cannot delivery because there is no-one to sign for the goods and no other arrangements were made, then we reserve the right to charge a re-delivery fee. You will be notified of this re-delivery fee by e-mail, and it will be taken from the card which was used for payment. Please ensure that there will be someone to accept delivery or contact us for more information about delivery options or to arrange a timed delivery. 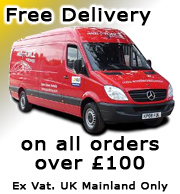 Free delivery is available on qualifying orders delivered to the UK Mainland, whose order value is over £100ex Vat. This offer is subject to changes and restriction, details available on request. Please carefully check your order value at checkout, and only finalise your checkout process when you are satisfied you have understood the discount, and it has been applied. Basic returns policy: If for any reason you are unhappy with your purchase, you can return it to us in its original condition within 14 days of the date you received the item, unopened (with any seals, Packaging and shrink-wrap intact) and we will issue a full refund. Several types of goods are exempt from being returned. Custom Tools which are manufactured to your design, whether unused or not, unless specifically expressed, or a Manufacturing fault. We accept no responsibility for the performance of Custom Tools. To complete your return, we require a receipt or proof of purchase, and you must get a ‘Returns Authorization Number’, which is clearly displayed on the package. To get this simply email sales@g-gibson.com With details of your order. If you purchased goods from us which are not manufactured by us, please do not send your purchase back to the manufacturer, send them to us. If a tool has had significant use, and the cause of the fault is unclear due to the extensive use/damage of the tool, then we reserve the right to investigate, and subsequently, if no manufacturing fault can be found, refuse or reduce your claim value, on a ‘Fair use’ basis. We would urge you to send any tool failures back to us as soon as you notice it to be faulty. However, If we find a manufacturing fault to be the cause, we will repair or replace the items up to 12 months after delivery. If you’ve done all of this and you still have not received your refund yet, please contact us at enq@g-gibson.com. We only replace items if they are defective or damaged. If you need to exchange it for the same item, first send us an email at enq@g-gibson.com and send your item to: Gibson House, Barrowby Lane, Garforth, Leeds, LS25 1NG, United Kingdom. To return your product, you should mail your product to: Gibson House, Barrowby Lane, Garforth, Leeds, LS25 1NG, United Kingdom. Depending on where your delivery address is located, the time it may take for your exchanged product to reach you may vary. We strongly suggest you use a shipping type which allows you to prove the item was sent to the correct address. You should consider using a trackable shipping service or purchasing shipping insurance. At the very least, utilise a ‘Signed for’ Service to cover small values. We don’t guarantee that we will receive your returned item. G Gibson & Co Limited are committed to protecting and respecting your privacy. For the purposes of data protection legislation, we are the data controller and we will process your personal data in accordance with the General Data Protection Regulation (EU) 2016/679 and national laws which relate to the processing of personal data. Please read the following carefully to understand our views and practices regarding your personal data and how we will treat it. 2.2.1 We may collect information about your device, including where available your Internet Protocol address, for reasons of fraud protection. We may also collect information about your device’s operating system and browser type, for system administration and to report aggregate information to our advertisers. This is statistical data about our users' browsing actions, patterns and does not identify any individual. 2.3.6 contact you for marketing purposes where you have signed up for these (see section 6 for further details). 2a.1.1 When you directly Interact with us on any of our Social Platforms, including Facebook, Twitter and Instagram. This could be by responding to our posts, or even our comments on another post. 2a.1.2 When you use a messaging service, such as Facebook Messenger, or a Direct Tweet on Twitter, to contact us. We may ask for your contact information, and details of how we can help, and if you reply to this request, your information will be treated exactly the same as you had contacted us directly through email, or through our own website. 3.1 We will collect details such as your name, address, phone number and email address when you order goods or services from us either via our Site or linked social media sites / other third party partner sites. We will use this information to process your order and comply with our contractual obligations. 3.2 In order to perform our contract with you, we may also need to share personal data with third parties such as payment providers and postal service organisations to assist in the delivery of goods or services you have ordered; this could include third party couriers or warranty providers. 3.4 We will retain your information as long as we require this to provide you with the goods or services ordered from us and for a period of 6 years afterwards. Where you have subscribed to receive marketing correspondence from us we will keep your personal data for the period of time described in section 6 below. We will collect details such as your employee names, telephone numbers and email addresses in order to contact you about goods or services ordered with you, to place further orders and to pay you for the goods and/or services supplied. We will keep the personal data for 6 years further to being provided with the goods/services. 6.1 In addition to the uses described in sections 2-4 above, where you indicate you would like to receive marketing correspondence from us, subscribe to our mailing lists or newsletters, enter into any of our competitions or provide us with your details at events, we may use your personal data for our legitimate interests in order to provide you with details about our goods, services, business updates and events, which we think may be of interest. 6.2.3 email us at dpo@g-gibson.com or call us with your name and contact details. 6.3 Where you have subscribed to receive marketing correspondence from us we will keep personal data 10 years from when you last interacted with us. We may monitor and record communications with you (such as telephone communications and emails) for the purpose of training, fraud prevention and compliance. We also have CCTV cameras installed in our premises for the purpose of crime prevention and for health and safety reasons. 8.1.2 to prevent fraud and money laundering. 8.2 Our search may be recorded on the files of the credit reference agency. 8.3 If further to undertaking a credit check you receive a low credit score, we reserve the right not to supply you with goods or services on credit and/or require upfront payment for the goods or services you wish to purchase. In this case a member of our team will notify you. 8.4 If you provide false or inaccurate information and we suspect fraud, we will record this. if you want to see your credit file, please contact our Customer Services team who will provide you with contact details for the Credit Agency used. 9.1.4 for our legitimate interests (as described within this policy) and your interests and fundamental rights do not override these interests. 10.2 We may disclose personal data to the police, regulatory bodies, legal advisors or similar third parties where we are under a legal duty to disclose or share personal data in order to comply with any legal obligation, or in order to enforce or apply our website terms and conditions and other agreements; or to protect our rights, property, or safety of our customers, or others. This includes exchanging information with other companies and organisations for the purposes of fraud protection and credit risk reduction. 10.3 We will not sell or distribute personal data to other organisations without your approval. 12.1 Where we have given you (or where you have chosen) a password which enables you to access certain parts of our Site, you are responsible for keeping this password confidential. We ask you not to share a password with anyone. 12.2 Unfortunately, the transmission of information via the internet is not completely secure. Although we will do our best to protect your personal data, we cannot guarantee the security of your information transmitted to our Site; any transmission is at your own risk. 12.3 Information you provide to us is shared on our secure servers. We have implemented appropriate physical, technical and organisational measures designed to secure your information against accidental loss and unauthorised access, use, alteration or disclosure. In addition, we limit access to personal data to those employees, agents, contractors and other third parties that have a legitimate business need for such access. 13.1 It is important that the personal data we hold about you is accurate and current. Please keep us informed if the personal data we hold about you changes. 13.2 Data protection legislation gives you the right to object to the processing of your personal data in certain circumstances or withdraw your consent to the processing of your personal data where this has been provided. You also have the right to access information held about you and for this to be provided in an intelligible form. If you would like a copy of some or all of your personal information, please send an email to dpo@g-gibson.com. In certain circumstances we reserve the right to charge a reasonable fee to comply with your request. 13.3.4 restrict the use of your personal data. 13.4 We may request specific information from you to help us confirm your identity and your right to access, and to provide you with the personal data that we hold about you or make your requested changes. Data protection legislation may allow or require us to refuse to provide you with access to some or all the personal data that we hold about you or to comply with any requests made in accordance with your rights referred to above. If we cannot provide you with access to your personal data, or process any other request we receive, we will inform you of the reasons why, subject to any legal or regulatory restrictions. 13.5 Please send any requests relating to the above to our Data Protection Officer at dpo@g-gibson.com specifying your name and the action you would like us to undertake.